Hello Kittens and welcome to the home of Bad Kitten Creations. I am Miss Lie, and this site is where you will find everything relating to my Pin-up and fantasy illustration art and custom portrait service. Here at Bad Kittens we love Vintage and alternative fashion and lifestyle, Pinup Art and fantasy from classic to modern, Burlesque in all it’s sparkling fabulousness, and making it all ours with DIY fun. So if any of that sounds like it’s up your street, then I hope you feel right at home! A self portrait by Lilly. If you are looking for custom pinup style portraits or tattoo designs you can find that option, as well as hand finished art prints at my Etsy store. “Lilly did an amazing job! The portrait she created of my husband and I from a few pics I submitted turned out great! She was extremely responsive to my questions and requests. Overall, a great purchase. Thank you!” Diana. “Miss Lilly did a wonderful, delightful pinup portrait of our daughter and we are excited to give her this unique gift to her for her birthday. Miss Lilly sent us several drafts until we were satisfied and then went above our expectations to add personal touches, making it truly special. We received the portrait days before it was due, ensuring that we had plenty of time to deliver it to our daughter. Many, many thanks, Miss Lilly. This is perfect and your talent and gift is amazing! ” E Warren. “I love to get “out of the ordinary” gifts for my wife. After sending a few photos of my wife and providing some input on ways to make this even more personal, I received the Pin-up art. The drawing far exceeded my expectations! I would have paid triple for this! My wife loved it!!!!! I think I might get a second one for her. Lilly was great to work with on this special gift.” J Lentini. and vintage fashion illustrations are also available from my Zazzle store, on not just posters canvas and other wall art options but also bags, collectibles, T shirts and more! Why is vintage style so popular? 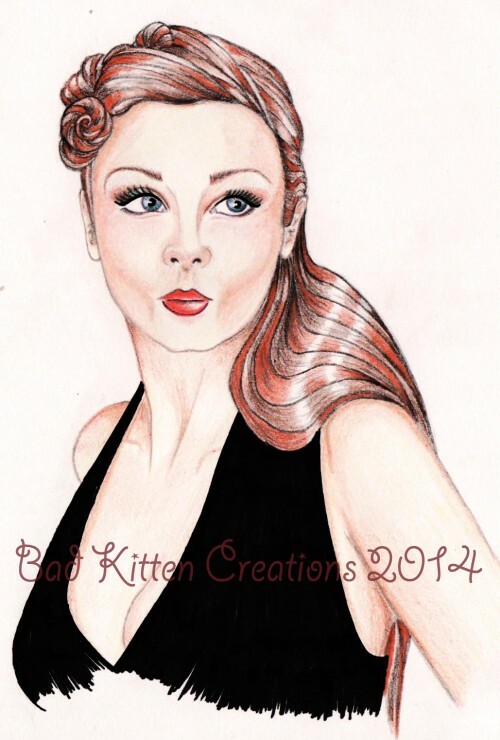 Like Bad Kitten Creations pinup art on FB for all my pinup art and vintage fashion stuff!